As January heads into it's last week, and I reflect on this first month of the new year, I realize that I did not make any new year's resolutions. I don't usually, as I find them difficult to keep. I really just strive to be the best version of myself. If I do that, then everything else falls into place somehow. I am just relaxing, and finding joy in my journey. 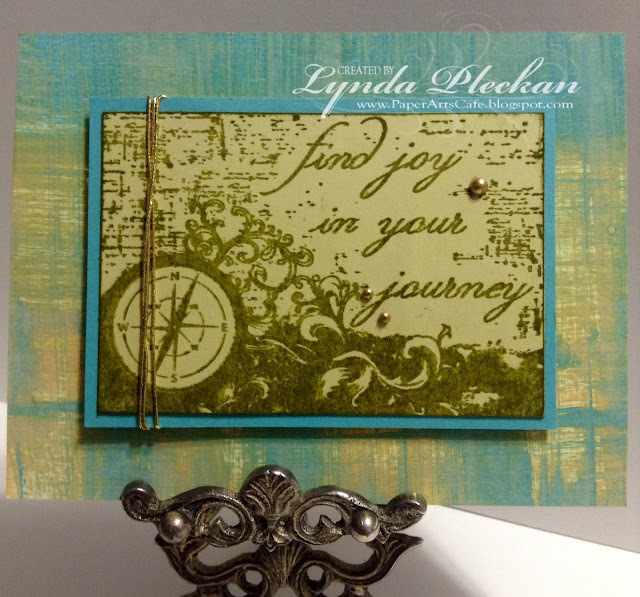 For my card, I used Technique Junkies stamp Joy In Your Journey. I inked the stamp with distress ink, and stamped it onto pale green card stock, then cut it out and mounted it to a blue panel. I wrapped some gold fiber around it, and added some pearl accents. I colored the white pearls with my gold Krylon pen. On a panel of white card stock, I ran a green distress oxide pad down and across the panel. I repeated this with a blue distress oxide pad. I love the background this technique creates. I added the panel to an A2 card front, then mounted my main image panel to it with foam tape for dimension. As this month comes to a close, how are you finding your new year going? Are you finding joy in your journey? Hopefully it is going well for you, and as expected. I hope you found inspiration in my card. 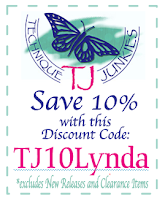 For a 10% discount on your Technique Junkies order, just use my code, TJ10Lynda.